Guide to Growing Toadflax, Butter and Eggs, & Baby Snapdragon. Linaria can be either hardy annuals or perennials and vary in height from 15 cm to 1.2 M.
They have lance shaped leaves and carry flowers that are similar to those of snapdragon. They bloom from the end of spring through to the middle of summer and have flowers of many colours including orange, purple and gold. Where you grow Linaria depends upon the species, smaller ones go well in the rock garden while larger varieties can be used in the border. Some of the common names for Linaria include Toadflax, Baby Snapdragon, Spurred snapdragon and Butter and Eggs. 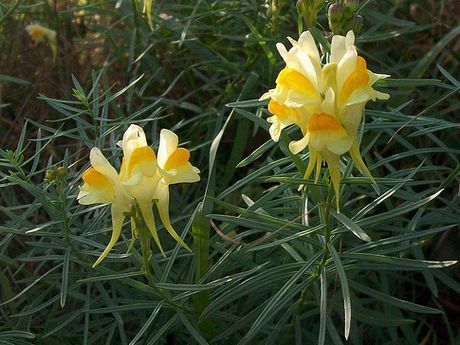 Linaria vulgaris - Common Toadflax by Anemoneprojectors; creative commons. 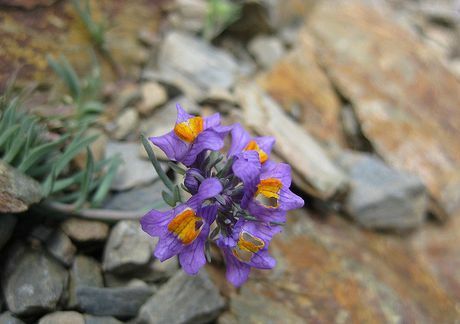 Linaria alpina – Alpine Toadflax by Francesca.c.r. Common Names: Toadflax, Butter and Eggs, Purple Toadflax, Moroccan Toadflax, Baby Snapdragon. Height: 4 to 48 inches (10 to 120 cm). Native: Europe, Asia, North Africa. Growing Region: Annual in zones 2 to 10. Perennial in zones 4 to 10. Flower Details: Yellow, gold, orange, red, white, violet, pink, purple. Snapdragon-like flowers. Raceme. Sow Outside: Cover seed. Sow from about three weeks before the last frost at two weekly intervals until the end of spring, and again in the autumn. Spacing 6 to 40 inches (15 to 100 cm). Sow Inside: Mix seeds in a growing medium, place in a freezer bag, keep moist, then stratify by refrigeration for three weeks. Germination time: two to three weeks in the light. Temperature 59°F (15°C). Seven or eight weeks in advance. Transplant outdoors following the last frost. Requirements: Full sunlight. Most soils, light and sandy for best results. Can survive in dry soils. Water during prolonged dry spells. Cut back after flowering to encourage a second bloom. Propagate: cuttings in late spring or early summer. Miscellaneous: The closely related American toadflaxes now belong to the Nuttallanthus genus. When growing Toadflax and other members of the Linaria plant genus outdoors from seed then sow out about three weeks before the last frost of spring, and continue sowing (using pre-chilled seeds) regularly for an extended flowering season. Once sown lightly cover the seeds. Toadflax likes to grow in sunny areas; the soil type is not important. If starting the plants off indoors then you will first need to imbibe the Linaria seeds by placing the seeds (within soil) in a black plastic bag, then placing in the fridge for three weeks. Seeds should then be sown out in the light at a temperature of 12 to 15 Celsius; they normally take about 10 to 14 days to germinate. Once growing transplant the seedlings from the last frost onwards at a spacing of 25 cm to 90 cm depending upon the size of the Linaria variety. Linaria is a relatively easy plant to look after; water regularly in dry periods; thin perennials; cut back annuals for a second bloom. If you require more perennial Linaria then divide in the spring or take cuttings at the start of summer.